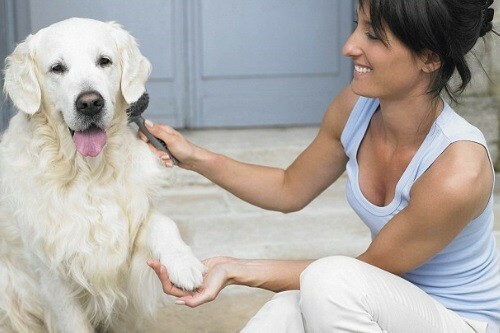 It is important to understand that when it comes to dog health and grooming, there are several aspects to understand. You need to do everything you can to ensure that you meet cover all the aspects of his inward and outward well-being. Instead of trying something you have never before have, ensure that each and every aspect is covered. A majority of the most important things you have to perform is when your canine companion is a just little pup. This is exactly the time when you try installing as many healthy habits as you can when he is young and growing. A lot of dog owners just think about performing keeping the dog physically fit and healthy when talking about dog grooming, however, it is important to understand there are other aspects of his health that you need to take into account. Although his physical health matters significantly so does his mental health – which is why you must expose him to different things around you. This is where socialization comes into play. You need to expose him to different people and other dog breeds and ensure that the encounter is safe, pleasant and does not end up scaring the dog or the person he is meeting. A dog that has a healthy interaction at a young age will always show signs of happiness and content. Moreover, this will benefit him, as he grows old. Should I Do It Regularly Or Frequently? Should I Do It Regularly Or Not? Should I Clean His Feet On A Daily Basis? Should I Trim His Nails Every Day? Where Should I Clip His Nails? How Frequently Should I Clean His Ears? When Should I Clean His Teeth? What you feed your dog is what is going to determine his physical and mental health. Like humans, dogs also need a combination of several vitamins and minerals to grow strong with a healthy immune system, which helps to ward off infectious diseases and viruses. The only way you can do that is to feed him organic and natural dog food. Dog food allergies have become quite a serious problem throughout the US. There is no way of telling what food component your ﻿﻿dog is allergic to﻿﻿, which is why feeding him a commercial brand can exasperate his symptoms leading to several medical complications. This is where you must always rely on hypoallergenic dog food products that contain organically processed ingredients. 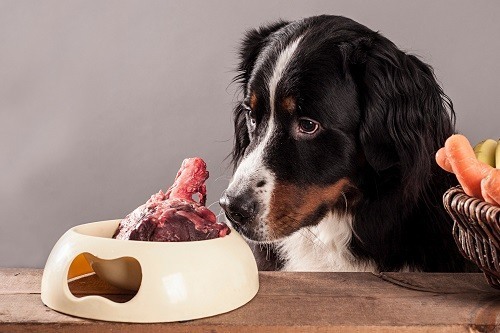 Moreover, natural dog food contains h﻿uman-grade me﻿at and lean protein. This means the meat your dog will eat will come from cattle, fish or poultry that is organically farmed and have not been subjected to antibiotics and growth hormones such as GMO based dog food brands. More than basic dog health and grooming, the best way of keeping your pooch on his paws and strong is to feed him natural foods. 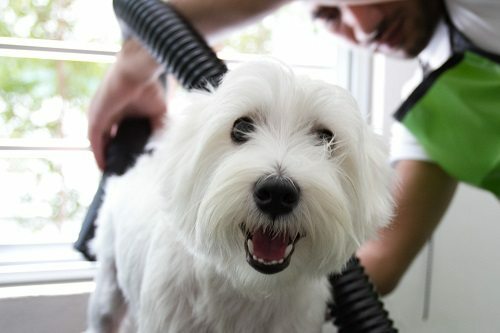 Dog grooming﻿ envelopes both the cleanliness of the dog and his total hygienic care – but it also refers to a specific process that most dog owners practice to enhance the appearance of their dogs. However, we are referring to its important as a way of keeping your dog clean and healthy. There is no question grooming your canine buddy is a means of enhancing his wellbeing and improving his chances of living a long, healthy life. 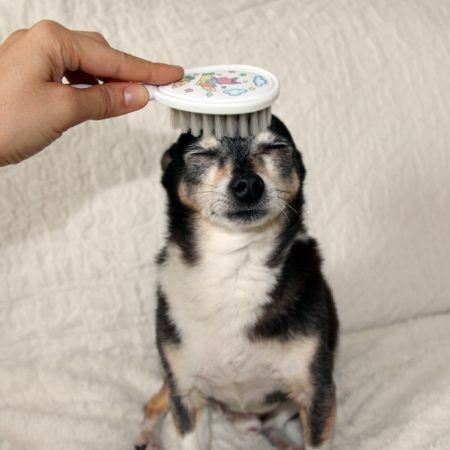 While some dogs require frequent grooming, others require daily grooming. However, that depends on the type of breed you own, his health level and his age. For example, if your dog is just a puppy right now, you don’t need to groom him on a frequent basis because he will be quite sensitive at that tender age. Frequent or regular dog health and grooming are an effective means to keeping your pet comfortable, clean and health﻿y ﻿in the long-run. On the other, it worth noting that while most dog breeds, there are breeds that do not shed fur. ​Grooming is a good way of ascertaining the health of your dog and allows for a thorough inspection of his coat, fur, and skin. You can look for several things such as inflammation, swelling, cuts, etc. Like humans need a good grooming pattern to stay healthy and to look good, dogs need a similar type of routine to keep up a healthy and clean appearance. When you are in the practice stages of dog health and grooming, it is important to approach your canines buddy with a positive and reassuring attitude. You need to be patient, especially in the beginning and you will need to use plenty of dog ﻿﻿treats. You need to take things slow at first and gradually add more grooming strategies as your dog begins to understand become used to what you do to him. Approaching dog grooming with a bad or frustrated attitude will only make thing hard, and your dog will begin to give your problems. If you aren't in a good mood, it is always better to groom him later. When it comes to toenail clipping, the first thing you must do is to consult a professional dog groomer. This especially important for people that need to clip dog toenails regularly. Unless your pooch as becomes filthy or has gotten into something that has tangled his fur, it is important to give him a bath every two or four months. It is important to understand that if you bathe your dog regularly, his skin will end up being dry, making it devoid of natural skin oils. First, it is vital to buy ﻿shampoo﻿ that is specifically made for dogs. Do not use what you use, don’t even try to experiment with it. Human shampoos contain plenty of chemicals that does not harm us but can be quite damaging for dogs. To begin, place a thick towel on the surface so he doesn’t slip in the tub or the sink or wherever that is you bath your dog. 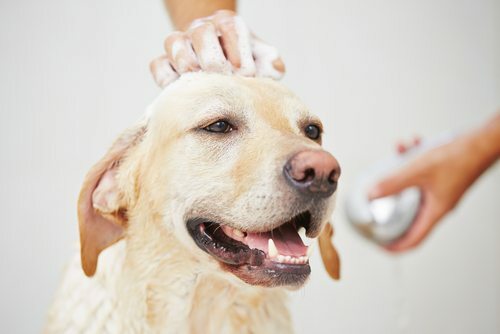 Gently lather the coat of the animal and then use plenty of water to ensure you get the shampoo out completely. It is important you don’t mistakenly leave shampoo residue on his coat. Moreover, ensure the lather does not get into his eyes, mouth, nose and ears, especially when you are rinsing him. Brushing your dog’s fur coat regularly is a very good practice, irrespective of how thick or long the coat is. That is because brushing helps get rid of dead fur or hair and helps his skin stimulate the production of natural oil that keeps the coat shiny and healthy. In addition to this, these natural oils also help maintain the skin moisturized. However, if you are starting out, brush your dog’s coat every other day. 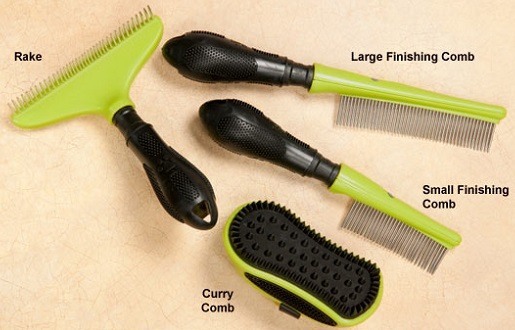 There different varieties of dog grooming brushes and combs available. While some combs and brushes are designed for general use, other types are made for specific purposes. Some general examples of the types of general grooming brushes include pin-head brushes and combs. Brushes for specific grooming include shedding bladed or a slicker brush. Although these brushes are useful for getting rid of your dog’s dead coat or hair mats, it is important to realize that you cannot use them for general brushing as it may damage your dog’s skin. You can also use finishing slicker combs and brushes, which can help make all the fringe and frizz to look fluffy. However, these brushes do not have some bristles to be used as generally. Therefore, when you are out looking for dog grooming brushes it is important to keep all the factors in mind, you need to list all the reasons what you need the brush for and then select accordingly. On the other hand, if you are using a brush on a puppy, keep in mind that he will chew on it and will not enjoy the brushing initially. To make him used to it, put the brush in front of him and allow him to smell it, and then start to brush him gently. You can also use dog treats to reward him if he behaves. Furthermore, when you start brushing him, keep the activity brief and gradually increase the time. You need to familiarize him and to ensure he enjoys the experience. Moreover, remember, you need to have a positive attitude. Keeping your canine buddy's feet clean and toenails clipped is pretty beneficial. Also, this isn't just because the dog will look nice and neat, but it is also because things like iceballs, salts, rock, etc. will not stick to his feet. These are all things that can make your dog uncomfortable and can also lead to infections and other medical complications. Well, you should always inspect his feet after you two come back from a walk or when you to take him to the park to play with him. However, if he remains indoors most of the days then inspecting him on a daily basis isn't necessary. The best way to groom your dog's feet is to use proper grooming scissors. Carefully use the dog scissors on the top of his feet. Be sure to place protective pads below the feet before you start trimming the toenails. Be very careful not to trim beneath the foot of your pooch or between all his toes. Because dog nails are curved, and that they also grow this way, if you allow his nails to grow too long, there is a strong possibility that if he runs or walks fast the nails will further curve and stick him right beneath the feet. The splaying of his nails may even cause injury and can also be pretty uncomfortable for him. On top of that, long toenails may also break his toes or fingers. The best way to avoid a harrowing situation is to clip his nails on a frequent basis. If you take care of this, you and also considerably minimize the chance of torn nails. Plus, as your dog is likely to run around in your home, with ﻿﻿﻿﻿big nails, he may even damage your carpet, the upholstery, and your wooden floor. Inspect your dog's toenails every two to three weeks. As a rule of thumb, if you hear a clicking sound when your dog walks or runs around in the house, it means that his nails have grown. When it comes to trimming dog nails, there are two methodologies you can opt for. Both styles are designed to do the job, but the methods also depend on how comfortable you are with using the two nail clippers. However, the blade on a nail clipper is quite sharp, which means it is important to be able clearly to see where you are cutting so that you don’t accidently clip a vein. In case that happens, it is necessary to keep some styptic powder handy to stop the bleeding. 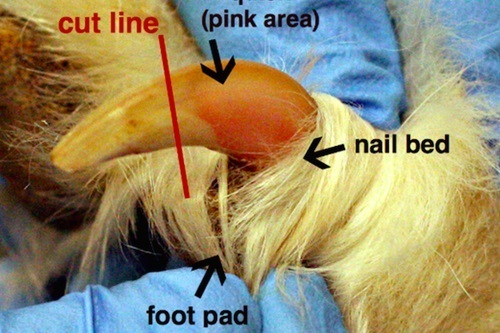 In case your canine friend has white nails, trimming dog nails can be easy as you will be able to clearly see his vein because of the translucency. This way you will be able to get rid of the tip of the toenail and not risk clipping anywhere near the vein. But some dogs have black nails, and if this is the case with your dog, you won’t be able to see the vein. This means you will have to gently and steadily clip the tip of the nail piece by piece. After about a few clips, his vein will begin to show – they are oval in shape. This is when you must stop clipping his nails. On the other hand, if you clip his toenails on a daily basis, you will see a hook shape formed at the tip of the thicker part of his toenail. You can clip this hooked nail as well. When you are clipping a puppy’s toenail, it is important to start very slow. Just like the brush or the comb, you need to familiarize your puppy with the dog clippers. Let him sniff the clippers first, make him hear the sound those clippers make and gently let him feel the Clippers by pressing it against his tiny paws. If you manage to clip a single nail, consider it a success. It is also important to remember that when you start clipping puppy nails, it may take a week or ten days to get them all done. Upon clipping one nail, give your puppy a tasty treat as a reward. Start and end with positivity. Nothing is more important than keeping the inside part of your dog’s ears clean to minimize his chances of getting an ear infection. 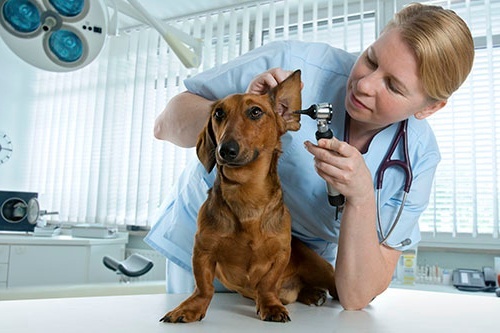 Frequently inspecting the exterior part of his ear will also tell you whether or not the dog has fleas or ticks outside the ear as well determining whether or not he has some other problem. 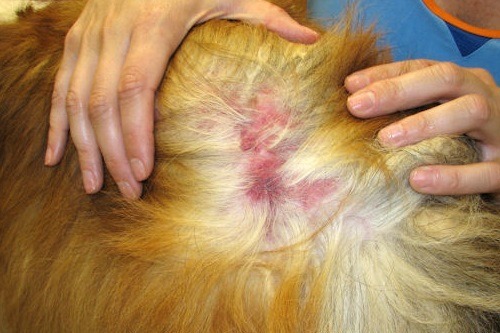 You should inspect and clean your dog’s ears once every week. There are some different things you can use to clean your dog’s ears. You can use a baby wipe, firmly wrap it around your fingers and clean both the interior and exterior of his ears. Or you can use gauze or a cotton ball to do the trick. Refrain from using water to clean his ear because water does not evaporate quickly or easily and can travel inside his ear. Plus, remember to clean the inside of your dog’s ear using your finger and stick your finger as far as it can penetrate inside. Refrain from using Q-tips or any other thing that can damage the ear drum. 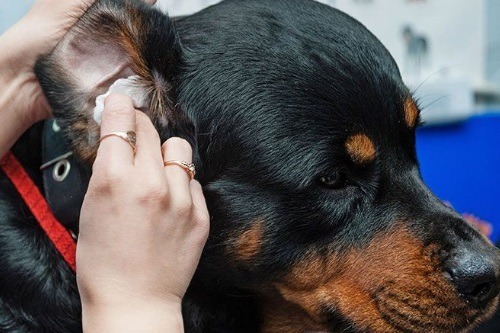 On the other hand, if you are cleaning your dog’s ears and see a weird fluid or discharge coming out of it, immediately take him to see the veterinarian. Dogs are susceptible to the same kinds of oral complications and diseases as we humans are. For example, poor oral hygiene can lead to gum inflammation, halitosis, gingivitis, cavities, tartar, and plaque buildup. In addition to this, the bacteria formed on his gum may easily travel down his system and flow through the bloodstream, which will, in turn, lead to several other medical complications. Cleaning your dog’s teeth on a daily basis can help maintain your dog’s overall health. And you will also be able to save a lot of money by not having to go to your veterinarian. 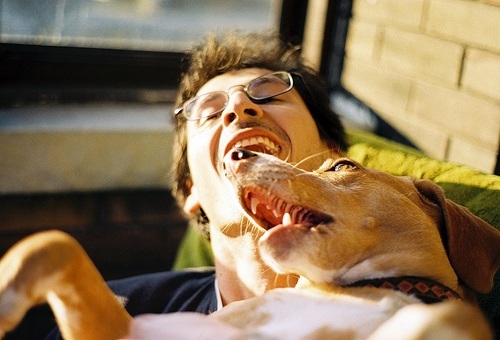 Clean your canine buddy’s teeth twice or thrice every week. 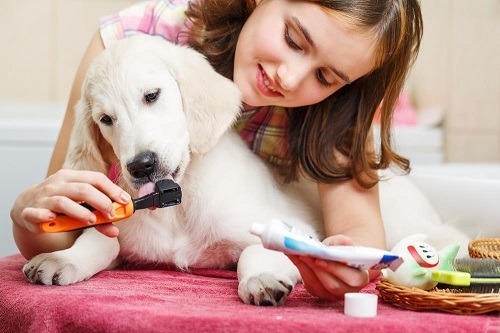 There are different types of health care supplies and dog grooming tools that are designed to help clean their teeth easily and comfortably. You can use a finger cap that acts as a safe scrubber and can effectively clean your dog’s teeth without hurting him. Or you can also use some gauze, wrap it around your finger and use it to clean his canines and other teeth. Refrain from using human toothpaste because it contains chemicals that may upset his stomach. Moreover, the toothpaste will also foam a lot and will be difficult to rinse it. You can also buy a dog toothbrush and toothpaste that is designed for pets. You can even make some dog toothpaste at home using baking soda and water. Furthermore, you need to remember to just clean the exterior of your dog’s teeth. You don’t need to go all the way inside. His tongue will keep the teeth at the back clean. In the case of a puppy, you have to start gently and get the little guy used the toothbrush or the fingertip scrubber. Plus, you need to gently massage his gums. Remember always to use adequate brushes based on the type of coat your dog has. For dog breeds that have short hair, for example, Labradors, use combs that are designed to have shorter teeth. Plus, buy a curry comb – you will thank us later when you bath and dry the dog. For dog breeds that have medium-length coats and have undercoats as well for example a Husky, get a quality single rake or double rake comb to be able to effectively reach deep inside his undercoat. You must also invest in good slicker brushes as well. For dogs that have doodle-type coats, buy a pin brush. You can even get a straight comb or a slick brush as well. For dog breeds that have long hair, for example, a Maltese, buy a straight or slicker brush or comb. However, you must also keep a double rake comb at hand as well. Double rake brushes are effective for admitting a thick undercoat. For dog breeds that have wiry-hair, for example, the Brussels Griffon, you can use a matting comb. You can even go for a slicker brush. If your dog’s coat gets tangled all the time, the best thing you can do as a dog health and grooming practice is to apply some baby powder on his coat. Sprinkle a tiny amount all over his coat and gently massage the top of the coat. All the fur will gradually soften, enabling you to brush or comb his coat easily. On top of that, your dog will also end up smelling pleasant. Like humans, a dog’s health is subject to change, as he grows older. However, dog ages at a quicker pace compared to humans. Irrespective of what your dog’s age is, as his owner and friend, it is your responsibility to ensure you do everything you can to prevent him from developing serious illnesses and to help him fight different health conditions. You have to do all you can to make sure he does not fall ill. It wouldn’t have been great if your dog could talk to you and tell you he is feeling ill. Unfortunately, that isn't the case. 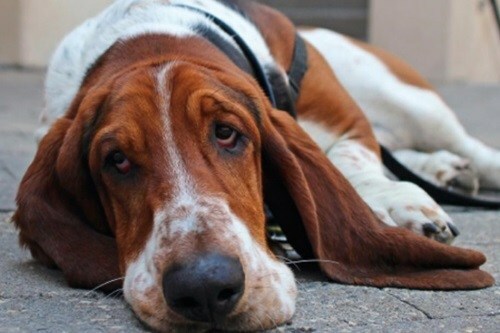 Although your canine buddy can’t tell you what he is going through, there are symptoms and signs and changes in his temperament that act as important signs that can help you catch an illness before it gets out of hand. Being aware of these symptoms is a sure shot way of preventing a lot of diseases and can help significantly minimize his chances of serious illnesses. 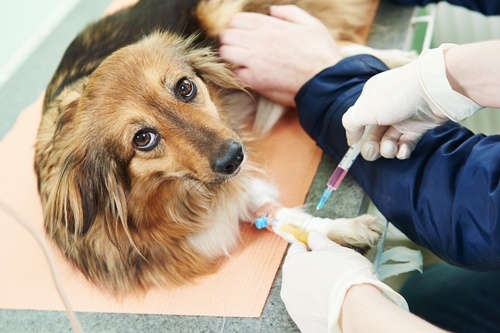 Did you know that approximately 10% of family pets seem to be active and healthy to both their owners and the veterinarian, but have serious underlying conditions? These dog health issues and dog illness symptoms can lead to serious medical condition or even worst. This is why if you spot these issues you must never hesitate or panic and immediately take him to the veterinarian for an intensive inspection. When you go to the vet, ask him a series of dog health questions and preventative measure that you can take to help your canine friend. You need to do everything necessary for your dog to stay healthy. And the most essential thing you can do is to give a clean and hygienic space to live. You need to shelter him from potential hazards, for example, excessive cold or heat. Plus, your dog needs to stay in a place with ventilation. 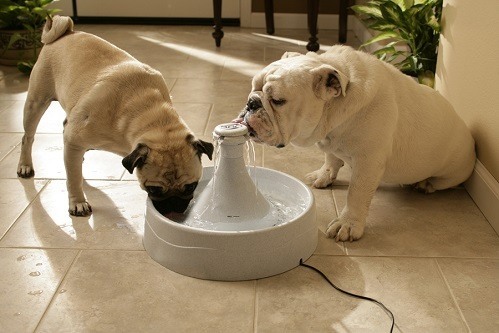 The dog needs to stay hydrated to keep their bodies active and energetic, much like us. This is why you need to provide your dog with a clean and fresh source of water. Always replace the water on a daily basis. Dogs are highly susceptible to food allergies, which can also lead to numerous other types of medical problems. On the other hand, owners who feed their dogs too much are also putting them at risk. Obese dogs can suffer from debilitating diseases such as diabetes and respiratory disorders. This is why it is important to feed the hypoallergenic foods that contain naturally and organically processed ingredients. These for health dog food products also contain a powerful combination of ﻿vita﻿mins and minerals, essential for muscle strength, brain development, and increased bone density. However, before you change your dog’s diet, consult with an experienced veterinarian. It is important to take your dog to the vet every twice or thrice a month. The vet will thoroughly examine your dog and look for any underlying heart conditions or any other problems that your dog may have developed. In addition to this, your vet will also provide you with detailed information on difference vaccination timings, parasite prevention control and deworm. You must always keep your dog’s vaccination records handy, especially when you travel anywhere outside the city or the country with him. Immediately get in touch with your vet if your dog begins to act differently or any one of the signs above of dog illness. Go to the vet if your dog sustains a minor injury. You have to provide your dog all the necessary opportunities to stay active and to exercise whenever he can. Take him out for daily walks, play “catch the frisbee” with him in the park and ensure he participates with your in any healthy activity. The more exercise he gets, the stronger he will become. He will also gain a lot of stamina, which will help him as he ages. Understand that these creatures are incredibly social and it is imperative for them to communicate with you on a constant basis. Spending a bit of quality time every day with your dog is a very useful method of understanding your buddy. You will gradually begin to understand what he likes, what he doesn’t like. This will also help you identifying common signs of underlying health complications. This is also the best way for you to ensure your dog does not form an abrupt behavioral pattern. 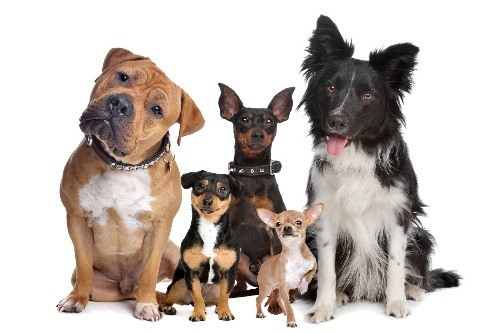 Dog training or puppy training classes is good for dog health and grooming. If your dog effectively learns to obey basic commands like “stand,” “sit” or “roll-over” or any other numerous commands the higher his chances are for living a healthy and long life. If you don’t want your dog to have puppies, the best thing you can do is spay or neuter him. These are the most optimal techniques available. However, if you want to breed the canine for any reason at all, you must take all the right actions and do everything you can to eliminate the chances of mismating. This is where you must consult with your veterinarian. These conditions can, in turn, give birth to numerous other health complications, not to mention cause tooth loss as well. Clean his teeth every 2 to 3 days a week. You can use toothbrush and toothpaste designed for dogs. Remember, the bacteria in your dog’s mouth can travel down in his bloodstream and can cause cardiovascular issues. 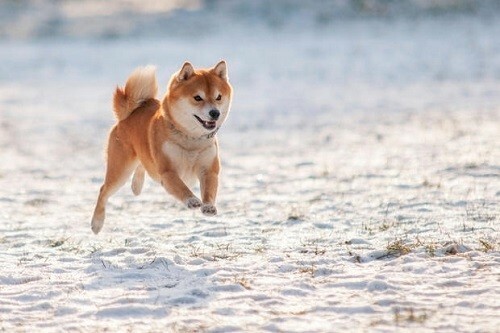 A dog with a shiny coat means he is healthy and active. The only way to help him stay healthy and free from skin infections and other problems is to subject him to frequent dog health and grooming techniques mentioned earlier. Dog health care supplies such as grooming scissors and dog grooming brushes or dog clippers are necessary components to keep your dog looking good, smelling fresh and disease free. While there in no doubt that there are so many types of different products available and are designed to cater to varying dog breed there are still a lot of specifications that should be central in all dog grooming equipment. Remember, these dog grooming tools come in different specifications and dimension based on the age of your dog and his breed. One of the most critical factors you must keep in mind when shopping for dog grooming supplies is that they should be safe for the pooch. For example, if your dog has sensitive skin, the brush or comb you are getting to demand his fur should be soft and not cause any irritation or discomfort. Plus, ensure the comb or brushes you buy to provide a gentle and comfortable massage and not tear or scratch his skin. So there you go everything you need to know and understand the importance of dog health and grooming and how to invest in the right grooming supplies for your best friend.